The world is full of patterns. Some are natural, organic formations like snowflakes, animals spots and stripes, and the fractal growth sequences in trees and other plants. Others are man made in their design—architectural structures, visual motifs in fabrics and tiles, and the formulaic logic patterns in math and science. What all patterns share is that they are regularities in the world. We often think of patterns as being visually based but we detect patterns using all of our senses. Being able to recognize and generate patterns from varied experiences is a foundational part of aesthetics and a basic human survival skill. 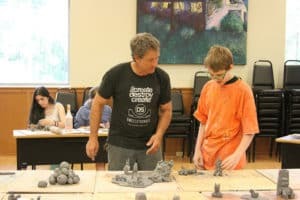 In this class we will study a variety of different patterns through projects designed to expand our vision and understanding. Get ready to roll up your sleeves and draw in this crash course for comics! Each day, we’ll work on different aspects of the form to equip each artist’s tool belt. We’ll work on character design, diving right into exercises that even pro cartoonists use to warm up and bolster their cartooning style. What’s more, we’ll focus on scripting and paneling language unique to comics as a sequential art. 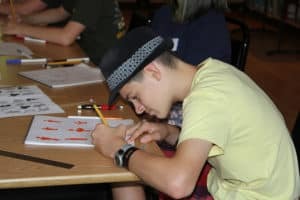 If you love reading comic books and have always wanted to work towards making your own, then this is the camp for you! 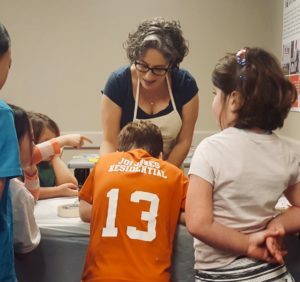 If you’ve been wanting to try out sewing and making your own clothes, this is the camp to get you started! 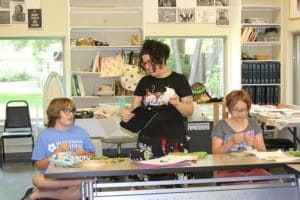 You’ll learn sewing machine basics, sewing and construction techniques while sewing your own clothes, accessories, and exploring garment refashioning techniques. Experience the joy of playing music with other young musicians in a fun, supportive, and engaging environment. Our instructors are music professionals with over 20 years of experience performing, writing, recording, and teaching music, and they are excited to help you achieve a killer performance on stage! In this camp, you’ll gain experience learning, rehearsing, and performing music in a variety of genres as an ensemble. You’ll also gain experience reading charts and properly handling sound gear, as well as develop confidence and stage presence. After one week of intensive musical training, camp attendees will play a live show together for an invited audience. Requirements: Ability to play an instrument (unless you are a vocalist) and to recognize basic chords and keep simple beats. Led by Griffin Music Instructor Ryan Young. Have a fun and exciting week learning the art of Music Production! 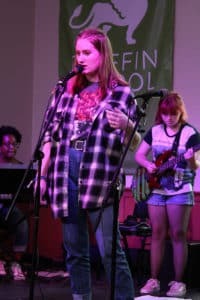 Students will learn proper microphone techniques, use of digital software, basic editing and mixing skills, and much more. 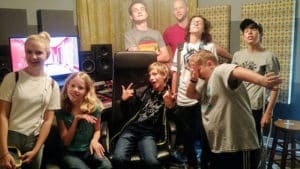 We will spend time at Suite 2E Studio–a professional recording studio–where you will learn concepts and techniques that apply to all recording environments. This camp is open to musicians and non-musicians alike. For those who play instruments, you’ll learn proper techniques and procedures to make great recordings of your playing. And if you’re more interested in the engineering and mixing side of things, you’ll learn basic editing and mixing methods that will help you to create professional sounding recordings. A laptop with recording software is encouraged, but not required. Mac or PC is fine, and recommended recording software includes GarageBand, Logic, ProTools, Reaper, or Ableton. 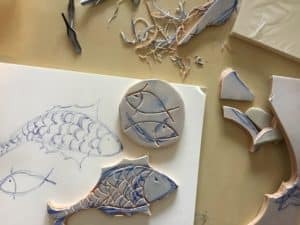 We will explore different types of relief printmaking from carving potatoes to wood, inking up carved images with brayers, and printing onto paper and textiles. We’ll experiment with creating repeated patterns, multi-color prints and registration. We will explore silkscreen by creating stencils and using photo emulsion to squeegee ink through fine mesh screens. We’ll experiment with multi-color printing and registration and printing onto paper, textiles and other materials. Students will have an opportunity to create a collaborative print suite of signed and editioned prints.